Kuuki: Art Design and Creative Media Kuuki: Art Design and Creative Media - Lumia. art | light | motion. Lumia. art | light | motion. Lumia: art/light/motion was an major solo exhibition of the work of Kuuki presented by State Library of Queensland, seehttp://www.slq.qld.gov.au/lumia The exhibition explored contemporary life and encourage thought about the future through an extraordinary collection of hand-crafted and interactive electronic creatures and installations. The beautifully crafted new media artworks in Lumia: art/light/motion combine the bespoke with art and technology to create strange but intriguing objects. 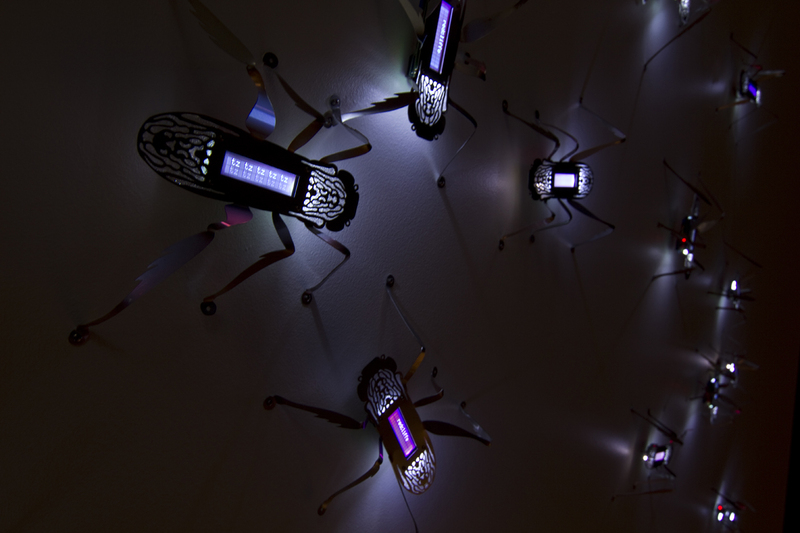 A swarm of electronic cricket that derive data from Internet traffic which is communicated wirelessly with the rest of the swarm. Common search terms spread through the swarm like memes displayed on the cricket’s LED screens. In this work memes replace the crickets’ song, changing on the whim of Internet users. Flashing LEDs on each cricket also change frequency in response to outside temperature. The audience can generate swarm reaction by making sound. 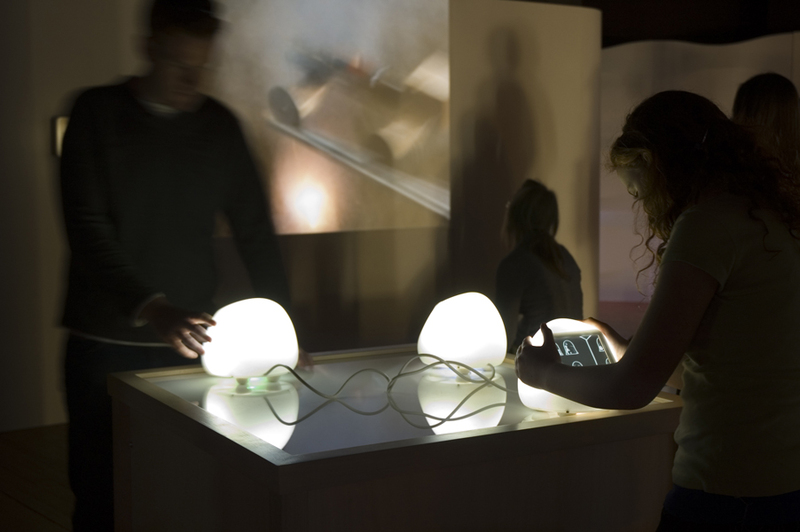 Distracted is an Interactive work with motion detection sensors that made inner core respond to touch. 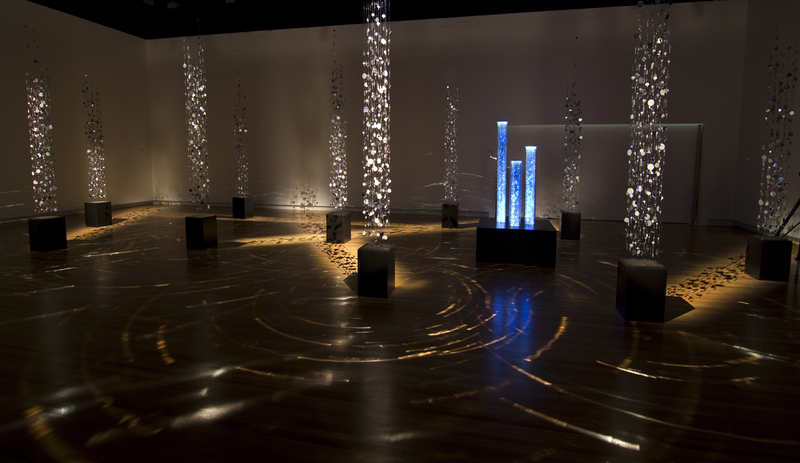 The Lighting display and a 6 channel audio sound scape is generated from data gathered from Vostok Ice Core Sample (Vostok Station Antarctica). Mirrors on outer poles independently attached to move as people create gentle air movements in the space. Reflected light patterns on floor result from this movement. 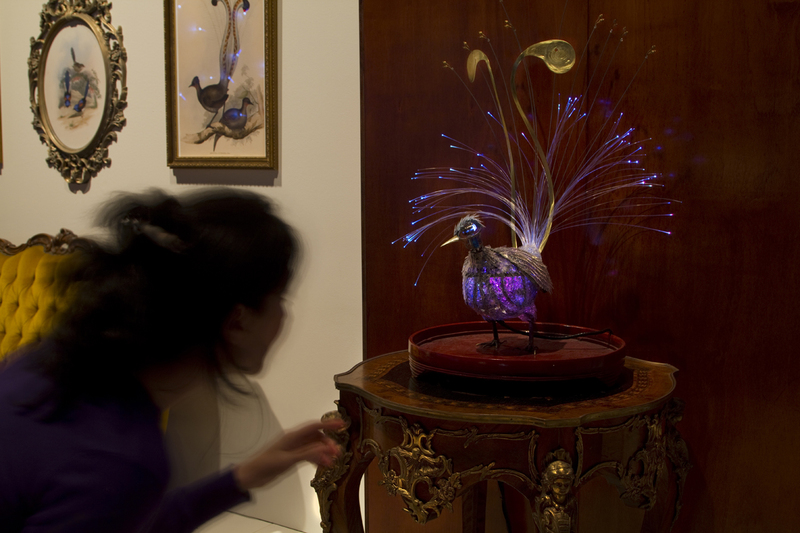 e. Menura superba is an interactive work inspired by hybridising the art of taxidermy with the notion of virtual pets. It explores the paradox between our fascination with exploring the exotic, and the potentially dystopic futures devoid of many animal species that our explorative nature may create. Antique and contemporary aesthetics are fused with refined post consumer waste materials, to create a simulacrum of a Lyrebird that is attracted by colourful clothing. The bird sings and changes the colour of its plumage to mimic clothing worn by people. It’s intricate clear polycarbonate plastic plumage is illuminated by an array of 35 tri-colour LEDs. Fitted with face recognition software and a video camera, it is able to recognise a face and study a person’s clothes to create a repertoire of plumage colours. Stainless steel, aluminium mesh, polycarbonate plastic, Philips Colour Kinetic controllable LEDs, servo-motor, Aurduino controller board, Mac laptop. 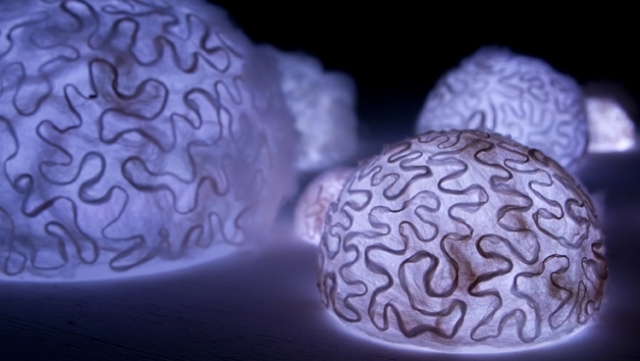 A cluster of fluffy felt brain coral sculptures connected in real time to temperature data collected by monitoring stations within the Great Barrier Reef, that form part of the Australian Institute of Marine Science’s Great Barrier Reed Ocean Observing System. These corals display illumination patterns showing changes in sea temperature drawn from stations at locations across the reef. Three different parts – suburban neighborhoods, apartment buildings and city spaces -of a hand drawn world are accessed via Charmed’s touch sensitive screens. Users can disrupt the lives of the figures that live in these spaces – going about their daily routines as if under a spell. Touching the screen can break the spell and provoke change. 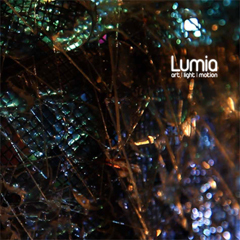 Along side the exhibition Kuuki produced a 48 page catalogue, Lumia : Art | light | motion. 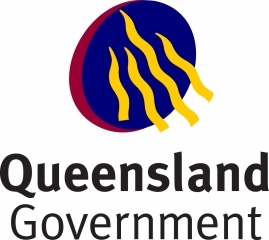 The Art of Kuuki published by the State Library of Queensland. It includes two essays academic essays and an interview. The first by artist and writer Paul Brown, who has specialised in art, science and technology since the late 1960s and in computational and generative art since the mid 1970s. Brown investigates the history of new media, and clearly places Kuuki at the forefront of this genre nationally. 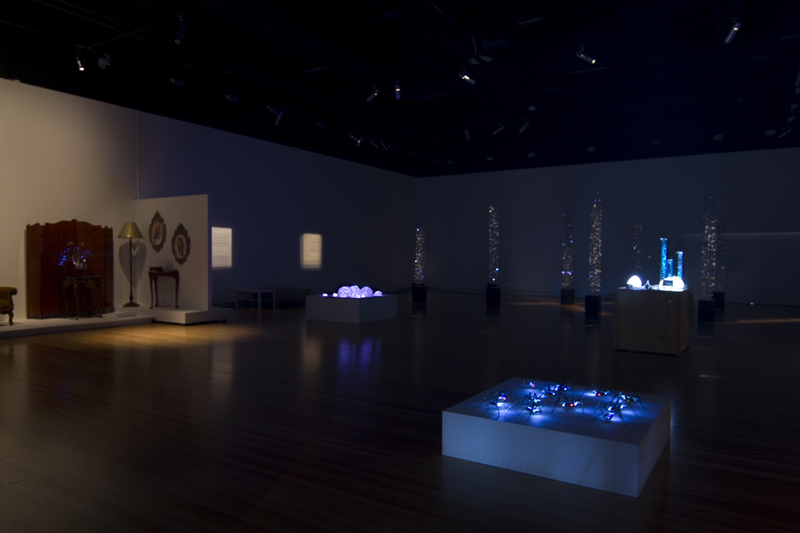 The second essay is by arts writer Linda Carroli, who has delved deeply into the thoughts and processes of Kuuki to bring to light the complex workings of the artists’ minds. The publication also features an interview Carroli conducted with the artists. To compliment the catalogue Kuuki produced a DVD documentary describing the each of the works in the exhibition. 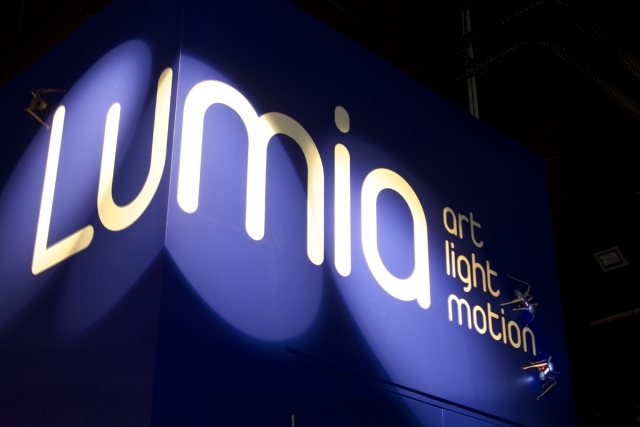 Videos from the DVD can be seen on this web site, and on our Vimeo channel for the Lumia exhibition. Education section of exhibition with custom touch screen game made by Kuuki for the exhibition using images sourced from the State Library of Queensland archives. 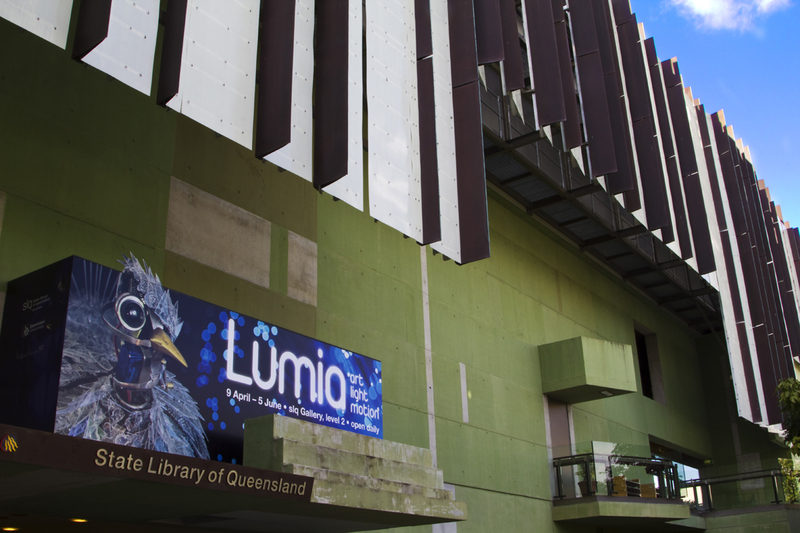 “The Light Fantastic” by Linda Phillips Summer edition of the State Library of Queensland magazine. 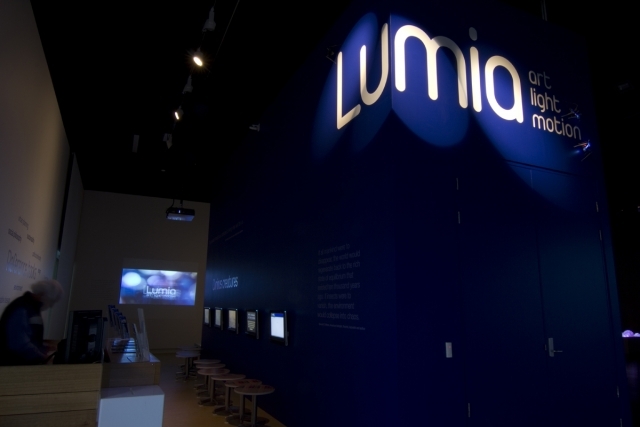 The Lumia exhibition is referenced in Shh. Listen. World Listening Day by Linda Carroli in Arts Hub.